I recently discovered that there's an XMPP client library (NuGet) for .NET that I overlooked a few months ago, and so I promptly investigated the building of a bot! The actual bot itself needs some polishing before I post about it here, but in writing said bot I stumbled across a perfectly brilliant library - released by Microsoft of all companies - that can be used to automatically extract common data-types from a natural-language sentence. While said library is the underpinnings of the Azure Bot Framework, it's actually free and open-source. To that end, I decided to experiment with it - and ended up writing this blog post. Data types include (but are not limited to) dates and times (and ranges thereof), numbers, percentages, monetary amounts, email addresses, phone numbers, simple binary choices, and more! It can extract an IP address (1.2.3.4), a number (3), and a few dates and times (last month, 5pm, 30 minutes). Of course, it depends on your use-case as to precisely how you unwind it, but the above should be a good starting point. Once I've polished the bot I've written a bit, I might post about it on here. Found this interesting? Run into an issue? Got a neat use for it? Comment below! I've blogged about the comment key system I utilise on this blog to prevent spam before (see also). Today, I've given it another upgrade to make it harder for spammers to fake a comment key! In the last post, I transformed the comment key with a number of reversible operations - including a simple XOR password system. This is, of course, very insecure - especially since an attacker knows (or can at least guess) the content of the encrypted key, making it trivial (I suspect) to guess the password used for 'encryption'. A modern, portable, easy to use crypto library. Anyway, after doing some digging I found the quick reference, which explains how you can go about accomplishing common tasks with libsodium. For my comment key system, I want to encrypt my timestamp with a password - so I wanted the sodium_crypto_secretbox() and its associated sodium_crypto_secretbox_open() functions. * Generates a new random comment key system password. * @return string   The base64-encoded password. * get mangled in transit with safer equivalents. * @param   mixed   $data   The data to encode. * @return  string  The data, encoded as transmit-safe base64. * Decodes data encoded with base64_encode_safe(). * @param   mixed   $base64     The data to decode. * @return  string  The data, decoded from transmit-safe base64. * Generates a new comment key. * Note that the 'encryption' used is not secure - it's just simple XOR! * serve as a nother annoying hurdle for spammers. * @param  string $pass The password to encrypt with. Should be a base64-encoded string from key_generate_password(). * @return string       A new comment key stamped at the current time. They are a bit long, but not unmanageable. In theory, I could make it a bit shorter by avoiding converting the integer output from time() to a string, but in my testing it didn't make much difference. I suspect that there's some sort of minimum length to the output string for some (probably good) reason. * Decodes the given key. * @param  string $key  The key to decode. * @param  string $pass The password to decode it with. * @return int|null     The time that the key was generated, or null if the provided key was invalid. * @param   string  $key        The key to decode and verify. * @param   string  $pass       The password to decode the key with. * @param   int     $min_age    The minimum required age for the key. * @param   int     $max_age    The maximum allowed age for the key. * @return  bool                Whether the key is valid or not. php > var_dump(key_generate_password());                                        string(44) "S0bJpph5htdaKHZdVfo9FB6O4jOSzr3xZZ94c2Qcn44="
Found this useful? Got an improvement? Confused about something? Comment below! For a quite a considerable amount of time now, I've been running my own placeholder image generation service here at starbeamrainbowlabs.com - complete with etag generation and custom colour selection. Although it's somewhat of an Easter Egg, it's not actually that hard to find if you know what you're looking for (hint: I use it on my home page, but you may need to view source to find it). I decided to post about it now because I've just finished fixing the angle GET parameter - and it was interesting (and hard) enough to warrant a post to remind myself how I did it for future reference. Comment below if you knew about it before this blog post came out! Aside from implementing the random value for fg_colour and bg_colour, the angle has been a huge pain. I use GD - a graphics drawing library that's bundled with practically every PHP installation ever - to draw the placeholder image, and when you ask it to draw some rotated text, it decides that it's going to pivot it around the bottom-left corner instead of the centre. Naturally, this creates some complications. Though some people on the PHP manual page said method (imagettftext) have attempetd to correct for this (exhibits a and b), neither of their solutions work for me. I don't know if it's because their code is just really old (13 and 5 years respectively as of the time of typing) or what. Anyway, I finally decided recently that enough was enough - and set about fixing it myself. Basing my code on the latter of the 2 pre-existing solutions, I tried fixing it - but ended up deleting most of it and starting again. It did give me some idea as to how to solve the problem though - all I needed to do was find the centre of where the text would be drawn when it is both not rotated and rotated and correct for it (these are represented by the green and blue crosses respectively on the image at the top of this post). PHP does provide a method for calculating the bounding box of some prospective text that you're thinking of drawing via imagettfbbox. Finding the centre of the box though sounded like a horrible maths-y problem that would take me ages to work through on a whiteboard first, but thankfully (after some searching around) Wikipedia had a really neat solution for finding the central point of any set of points. The odd and even indexes of $bbox there are referring to the $x$ and $y$ co-ordinates of the 4 corners of the bounding boxes - imagettfbbox outputs the co-ordinates in 1 single array for some reason. I also calculate the original width and height of the text - in order to perform an additional corrective translation later. The first command downloads all the required frames (3 at a time), and the second stitches them together. The -q:v 3 bit of the ffmpeg command is of note - by default webm videos apparently have a really low quality - this corrects that. Lower is better, apparently - it goes up to about 40 I seem to remember reading somewhere. 3 to 5 is supposed to be the right range to get it to look ok without using too much disk space. That's about everything I wanted to talk about to remind myself about what I did. Let me know if there's anything you're confused about in the comments below, and I'll explain it in more detail. The above represents a very basic calculator-style syntax, which only supports adding and dividing. It's written in Backus-Naur Form, which is basically a standardised way of writing parsing rules. While it looks complex at first, let's break it down. There are 3 parts to this table: The state, the action, and the goto. The action and goto represent What should happen if a particular token is encountered. In this case, the input stream contains both terminal (i.e. DIGIT, DIVIDE, BRACKET_CLOSE, etc. in the case of our BNF above) and non-terminal (i.e. number, term, expression, etc. in the case of our BNF above) symbols - if understand it correctly, so there are actually 2 parts to the table here to make sure that both are handled correctly. We'll be connecting this to our lexer, which outputs only terminal symbols, so we should be ok I believe (if you know better, please post a comment below!). The state refers to the state in the table. As I've mentioned before, a given state may contain one or more configurations. It's these configurations that give rise to the actions in the table above, such as s2 (shift and then go to state 2) or r3 (reduce and jump to state 3). To use the table, the parser must know what state it's in, and then take a look across the top row for the next symbol it has in the token stream. Once found, it can follow it down to figure out what action it should take, as explained above. If there isn't an action in the box, then there must be an error in the input, as the table doesn't tell us what to do in this situation. To that end, we should try and generate a meaningful error message to help the user to find the mistake in the input (or the developer in the parser!). The asterisk represent where the parser might have gotten up to. Everything to the left is on the stack of the parser, and everything to the right hasn't happened yet. Since this isn't a top-level rule (in our example that honour goes to the rule for the start non-terminal), the parser will never be in a position where the first item there doesn't exist yet on the stack, so we can ignore the configuration in which the asterisk would be to the left of BRACKET_OPEN. Basically, the parser will be taking in the input token stream and either shift a new terminal token onto the stack, or reduce one or more existing tokens on the stack into a single non-terminal token, which replaces those existing tokens on the stack. The configurations above represent possible states of the stack (the bit to the left of the asterisk), and possible directions that the parser could take when parsing (the bit to th right of the asterisk). Finally, when the goal is reached, the output is returned to the caller (which, by the time we're done, should be a parse tree). Said tree can then be optimised and processed for whatever purpose we desire! Since the main ShiftReduceParser class is going to hold the rules, the ParseTable class will need a reference to its parent ShiftReduceParser in order to query the rules. In light of this, the SHiftReduceParser should be responsible for satisfying any queries the ParseTable has about rules - the ParseTable should not have to go looking & filtering the rule list held by ShiftReduceParser itself. This method in ParseTale will need to be extremely careful it doesn't get stuck in a loop. To that end, it'll have to keep track of whether it's already processed a rule or not. It'll probably also have to keep track of which configurations it has added to the table class structure we defined in the last post to avoid adding rules twice. Once ParseTable has figured out all the configurations and grouped them all into the right states, it will then have to recurse over the generated table and fill in all the shift / reduce / goal action(s) - not forgetting about the links to the other states they should point to. It's quite the laundry list! Thankfully, most of this is quite simple if we tackle it one step at a time. The most annoying bit is the grouping of configurations into states. This is done by looking at the token immediately before the asterisk in each configuration - all the configurations with the same token here will get grouped into the same state (while there are more complex algorithms that allow for more complex grammars, we'll stick with this for now as anything else makes my head hurt! Maybe in the future I'll look as figuring out precisely what kind of LR-style parser this is, and upgrading it to be a canonical LR(1) parser - the most advanced type I know of). This is quite a lot to take in, so I think I'll leave this post here for you to digest - and we'll get to writing some code in the next one. Found this useful? Spotted a mistake? Having trouble getting your head around it? Post a comment below! Now that I've done the Languages and Compilers module at University, it's opened my eyes to a much better and more extensible way of handling complex text in a way that can easily be read by any subsequent code I write. To that end, I've found that at least 3 different various projects of mine could benefit from the inclusion of a shift-reduce parser, but I haven't been able to track one down for C&sharp; yet. In this mini-series, I'm going to take you through the process of building a shift-reduce parser of your very own. As I write this, I haven't actually finished mine yet - I've just got to the important milestone of building a parse table! Thankfully, that's going to be a few posts away, as there's a fair amount of ground to cover until we get to that point. Warning: This series is not for the faint of heart! It's rather complicated, and extremely abstract - making it difficult to get your head around. I've had great difficulty getting mine around it - and ended up writing it in multiple stages. If you want to follow along, be prepared for lots of research, theory, and preparation! 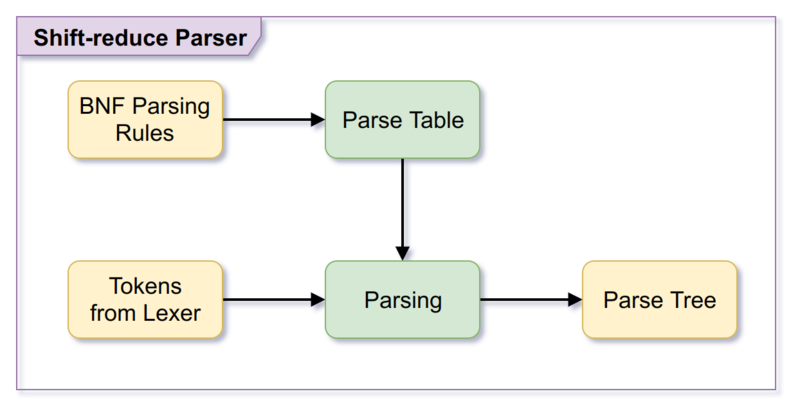 Let's start out by taking a look at what a shift-reduce parser does. If you haven't already, I'd recommend reading my previous compilers 101 post, which explains how to write a compiler, and the different stages involved. I'd also recommend checking out my earlier post on building a lexer, as it ties in nicely with the shift-reduce parser that we'll be building. Pretty simple! A token in a rule can either be a terminal (basically a token straight from the lexer), or a non-terminal (a token that the parser reduces a set of other tokens into), and has a type - which we represent as a string. Unfortunately due to the complex comparisons we'll be doing later, it's a huge hassle to use an enum with a template class as I did in the lexer I built that I linked to earlier. Later on (once we've built the parse table), we'll extend this class to support attaching values and other such pieces of information to it, but for now we'll leave that out to aid simplicity. I also override Equals() and GetHashCode() in order to make comparing tokens easier later on. Overriding ToString() makes the debugging process much easier later, as we'll see in the next post! /// A function to call when a reduce operation utilises this rule. 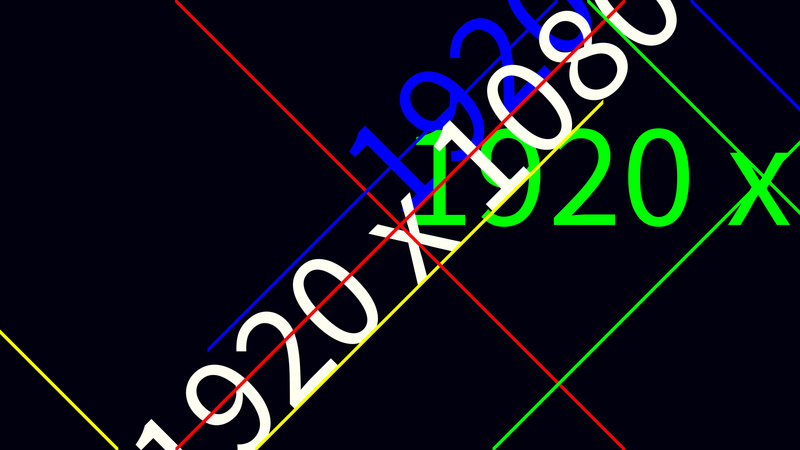 The above represents a single parser rule, such as <number> ::= <digit> <number>. Here we have the token on the left-hand-side (which we make sure is a non-terminal), and an array of tokens (which can be either terminal or non-terminal) for the right-hand-side. We also have an Action (which is basically a lamba function) that we'll call when we match against the rule, so that we have a place to hook into when we write code that actually does the tree building (not to be confused with the shift-reduce parser itself). Here I also add a method that we'll need later, which compares an array of tokens against the current rule, to see if they match - and we override ToString() here again to aid debugging. Now that we can represent tokens and rules, we can start thinking about representing configurations and states. Not sure what these are? All will be explained in the next post, don't worry :-) For now, A state can be seen as a row in the parse table, and it contains a number of configurations - which are like routes to different other states that the parser decides between, depending where it's gotten to in the token stream. /// Whether this configuration is the last in the sequence of configurations for the specified rule or not. This class is slightly more complicated. 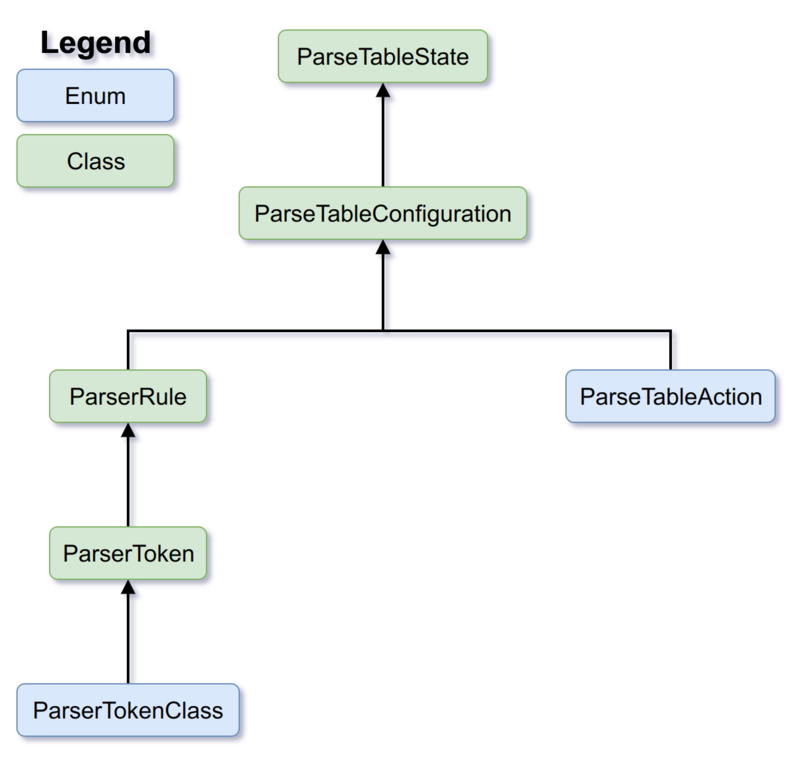 First, we define an enum that holds information about what the parser should do if it chooses this configuration. Then, we declare the configuration class itself. This entails specifying which parse rule we're deriving the configuration from, and both which tokens in the right-hand-side of the rule should have been parsed already, and which should still be somewhere in the token stream. Again, I'll explain this in more detail in the next post! Then, we declare a few utility methods and properties to fetch different parts of the configuration's rule, such as the token to the immediate left and right of the right-hand-side position (which was represented as a dot . in the book I followed), all the tokens before the dot ., and whether a given rule matches this configuration in the basis of everything before the dot .. Finally, I continue with the trend of overriding the equality checking methods and ToString(), as it makes a world of difference in the code coming up in future blog posts! Much simpler than the configuration rule class, right? :P As I mentioned earlier, all a state consists of is a list of configurations in that state. In our case, we'll be assigning an id to the states in our parse table, so I include a property here that fetches a state's id from the parent parse table that it's part to make the later code as simple as possible. Still with me? Congratulations! You've got the beginnings of a shift-reduce parser. Next time, we'll expand on some of theory behind the things I've touched on in this post, and possibly look at building the start of the recursive parse table builder itself. Found this interesting? Confused about something? Comment below! Recently I remembered that I had all the pieces I need to make a weighted version of the unweighted markov chain I built in part 2 of this series - specifically the weighted random number generator I built shortly after the unweighted markov chain. With this in mind, I decided on a whim to put all the pieces of the puzzle together - and this post is the result! Where to start... hrm. I know. To start with, I needed to perform a minor upgrade tot he WeightedRandom class I had. If you haven't read the original post about it, I'd recommend doing so now. With a count property in place, I also found I was going to need a way to dynamically swap out the weightings of the random number generator without creating a completely new instance - which would end up resetting the Random class instance it was working with, leading to a reduction in the quality in random numbers it uses under high load (see [this article]() for more information on that). To that end, I ended up refactoring the constructor into a pair of methods: SetContents, and a companion method ClearContents. Since the weight calculations happen when the items are first added to the generator, and I'd need to completely recalculate them if another item is added, I wasn't able to emulate the API for another existing class in .NET, such as the List class, as I like to do. Finally, I found later on I needed a way to initialise an empty weighted random generator, so I added a new empty constructor to facilitate that, along with an additional check in the Next() method that throws an InvalidOperationException if the generator is empty and you try to ask it to pick a random item. /// An unweighted character-based markov chain. /// The ngrams that this markov chain currently contains. /// Creates a new character-based markov chain. /// Returns a random ngram that's currently loaded into this WeightedMarkovChain. /// Generates a new random string from the currently stored ngrams. /// The length of ngram to generate. /// it may end up being cut short. Here, we read in the raw n-grams and a dictionary that represents the number of times that a given n-gram has been discovered. It's got to be a double there as the type value of the dictionary, as apparently the C&sharp; compiler isn't clever enough to convert a Dictionary<string, int> to a Dictionary<string, double>. Hrm. Maybe they'll fix that in the future (or if not, does anyone know why not-)? You can find it on my private git server here, if you're interested in any future improvements I might have made to it since writing this post. Speaking of which, I've got a few in mind - mainly refactoring both this class and it's unweighted cousin to utilise lists of objects instead of strings. This way, I'll be able to apply it to anything I like - such as sentence generation, music improvisation, and more! I'd also like to extend it such that I can specify the weights manually, giving me even more flexibility as to how I can put the engine to use. The basic algorithm hasn't changed much since I first invented it: take the current timestamp, apply a bunch or arbitrary transformations to it, put it as a hidden field in the comment form, and then reverse the transformations on the comment key the user submits as part of the form to discover how long they had the page loaded for. Bots will have it loaded for either less than 10-ish seconds, or more than 24 hours. Humans will be somewhere in the middle - at least according to my observations! Of course, any determined spammer can easily bypass this system if they spend even a little bit of time analysing the system - but I'm banking on the fact that my blog is too low-value for a spammer to bother reverse-engineering my system to figure out how it works. This time, I chose to use simple XOR encryption, followed by reversing the string, followed by base64 encoding. It should be noted that XOR encryption is certainly not secure - but in this case it doesn't really matter. If my website becomes a high-enough value target for that to matter, I'll investigate proper AES encryption - which will probably be a separate post in and of itself, as a quick look revealed that it's rather involved - and will probably require quite a bit of research and experimentation working correctly. As I explained above, this first XORs the timestamp against a provided 'passcode' of sorts, and then it reverses it, base64 encodes it, and then returns it. I discovered that I needed to repeat the passcode to make sure it's at least as long as the timestamp - because otherwise it cuts the timestamp short! Longer passwords are always desirable for certain, but I wanted to make sure I addressed it here - just in case I need to lift this algorithm from here for a future project. Very similar. Again, the XOR passphrase has to be repeated to make it long enough to apply to the whole encoded key without inadvertently chopping some off the end. Additionally, we also convert the timestamp back into an integer - since it is the number of seconds since the last UNIX epoch (1st January 1970 as of the time of typing). A 40KiB 'live' specimen chunk's data, saved as a single minified JSON file. That's better! I can actually make some comparisons now. From this graph we can observe that gzip is the worst of the lot, followed by bzip2. 7zip is surprisingly in third place, but then again it is designed for multiple files, whereas the rest of them are designed for a single stream of data. In second place is the terribly slow brotli, and finally in first place is xz. Very interesting. 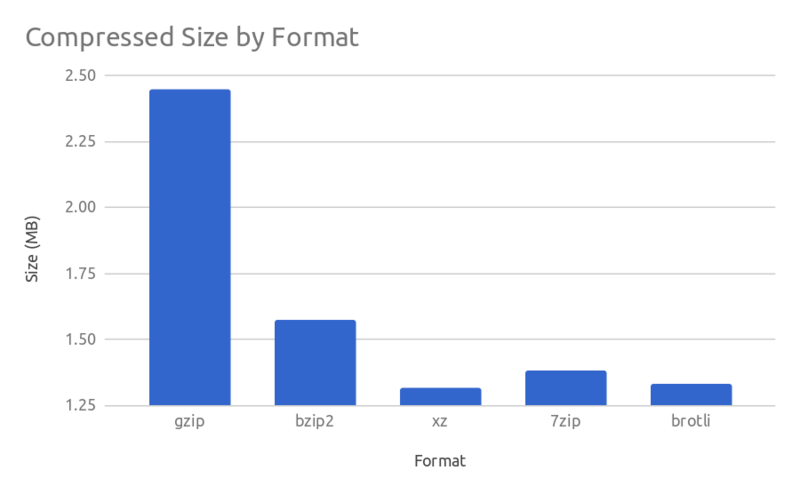 With smaller loads, it appears that bzip2 performs much better with smaller loads than any other algorithm. 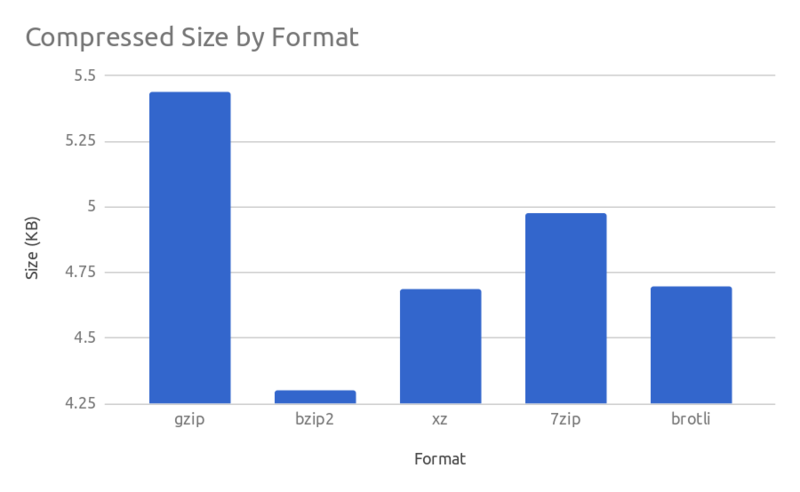 While gzip is still the worst performing algorithm, while xz and brotli, surprisingly, performed much worse than bzip2. To that end, I'm think I'm going to be choosing bzip2 as my compression of choice for this job, as it produces the best results for the type of work I'm going to be doing. I'm really surprised about brotli though, actually. I had high hopes for it, considering it's a new algorithm invented by Google. They claimed that it would provide xz-like compression with gzip-like speeds - but from what I'm seeing, it does anything but.